Ours is a 50+M GP guild and if we correct for learning mistakes, we should be doing 23/24 stars. I'm wondering if that's below, par or above expectations for such a power. Ideally, I would love to have a GP to stars curve (pretty trivial statistics). I'm not asking guild's names or anything, just data points. If you see that you forgot to deploy, or most people followed the tutorial and deployed before combat or such, and you think you should be doing one or two stars above, tell me what you honestly think you should be doing. KEEP THE DATA POINTS COMING! For now I'm getting a base of 5 stars plus roughly GP/3. As you can see, it looks like straight line up to 40 stars or so. 40/41 seems a ceiling. But may be next run with the lessons learned and more discipline we could see even higher numbers! 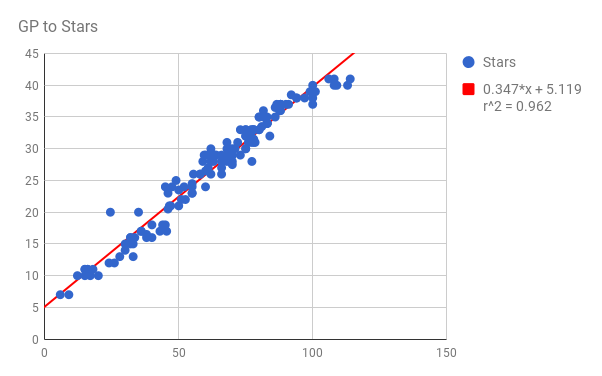 If we followed the linear prediction, 45 stars would require 115M GP. But I didn't run the numbers. It might require a bit more. Also, if you are to the LEFT of the line, you are punching above your weight. If you are to the RIGHT, you could probably do a bit better. This is a very crude statistic approach. A more detailed analysis would probably explain a lot more. But things like Dark Side GP, Fleet strengh, player participation and even rare toons high starring for the Phase 5 and 6 platoons play a huge role that such a besic approach can not discern. Thanks to @J7Luke for his spreadsheet (I did mine and got same results!!). 40M GP - we'll end with 16, but with proper coordination it could have been 18, maaaaaybe 19. 26 mil GP and bringing home 12* this 1st TB... should increse by 1 or 2 next time and hit 15* not to long after that. My smaller guild just broke 17 million and only hit 10 stars. 83mil and it looks like ~34. 38 mil GP , 16* is ready, could be 1 or 2 more if some of our strongest member would be more active in phase 4/5. Same here OP, my guild is right around 55 mil GP and we will finish with 24 or 25. "Ironing boards are surf boards who quit before they achieved their dreams. Don't be an ironing board." Guild power was ~8.5 million at the start. Right now we are at approx 9.5 million. 7 stars as of this morning, but I thought we would be lower. I don't think we'll make it to 8. Really proud of our guild! 32m GP and we scored 16 stars, could have been 18-19, which we'll correct the next time. 28M at the start of TB and 13 stars. Aiming for 15 starts next go. 60M GP at 26 stars. Possible 27. 36m, currently at 16 stars, but we should get at least one more, maybe a second if our ship deployment is high enough--we certainly won't get any ship platoons done, though. I think we left two stars on the table from misallocation (thought we could 2* both territories in phase 2, we wound up getting reeeally close, but only 1* each). 38 million, 16 stars (be very close to getting 17). Will be around 20 next time with right tactics and game stability (lost a few goes along the way, most noticeably in phase 1). 108 million, with 40 stars being a real possibility. We executed our plans each phase perfectly. Meaning, we literally can't do better at this point. 84mil should end with 32 stars. 70+ mil and we are at 27 stars with a very good chance to hit 28 before reset.